The Maysville Street entrance to the Aroostook Centre Mall in Presque Isle as seen in October 2017. The Aroostook Centre Mall in Presque Isle, which like the Bangor Mall has suffered from tenants such as Sears closing shop, is listed by online auctioneer Ten-X as up for sale to the highest bidder. Ten-X also is auctioning the Bangor Mall with bids starting at $6.5 million. Both malls are being run by The Woodmont Co., a Fort Worth,Texas-based property management company. Frederick Meno, president and CEO of asset services for The Woodmont Co., said last November that the JC Penney store leases in both malls had been renewed for multiple years. In a Saturday email to the Bangor Daily News, Meno said the leases are confidential. It is not clear whether there are clauses in the leases to let tenants leave earlier. Renewed leases can help prepare a mall for sale, experts said. 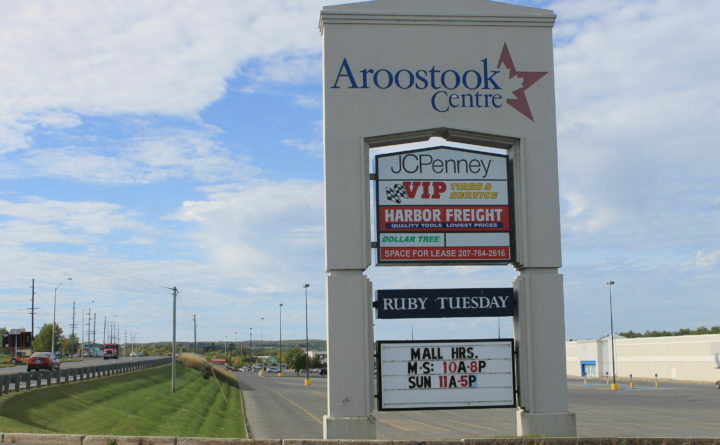 Management at the Aroostook Centre Mall was not immediately available to comment on the auction, which is accepting offers now from qualified investors. The mall has 557,601 square feet of rentable space. It was built in 1993 and has two buildings. The bids are for two components of the mall. One is a ground lease for 147,000 square feet and secured by Lowe’s. While Lowe’s was agreeable to a ground lease extension beyond the current term, the owners of the mall decided not to extend the lease because of concessions Lowe’s was requesting. The second component is the 410,000-square-foot mall. The Ten-X website said the mall offers significant opportunity for an investor to add value once the investor boosts the net operating income of the mall with a strong leasing program. Ten-X said the mall is being offered for sale by a special servicer. The servicer has been handling the property since June 2017, when the mall’s owner defaulted on a loan, according to a report by Trepp, a New York-based data analysis firm that tracks commercial real estate mortgages. The mall and the lender modified the loan in June 2018. A buyer will get the property free and clear of any existing debt.